Colby-Sawyer College celebrates its 181st Commencement on Saturday, May 11, at 10:30 a.m. on the college’s Quad. The ceremony typically lasts 90-120 minutes. 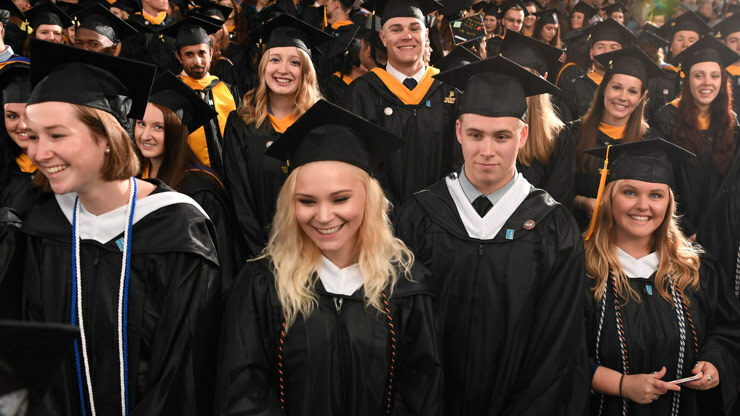 The 2019 graduates will be awarded degrees and outstanding students and other individuals will be honored for academic excellence, contributions to society, and service to the college and community. Parents, friends and family are also invited to celebrate graduates prior to Commencement on Friday, May 10, at the Scholars & Leaders Ceremony and Nursing Pinning Ceremony. The Scholars & Leaders Ceremony will take place at 2 p.m. in the Sawyer Center Theater, Sawyer Fine Arts Center, followed by the Nursing Pinning Ceremony at 4:30 p.m.
Tickets for Commencement, Scholars & Leaders and the Nursing Pinning ceremonies are not necessary, but there is limited seating under the Commencement tent. Seating is on a first come, first served basis. Families are encouraged to limit guests to four to six per graduate. For more information, view the full schedule of Commencement events.